Mobile readers: Click here for video. My mailbag this week consisted of an inquiry from Lynn P. It dealt with a dead hand and why erroneous exposures are returned to the hand. Then she followed up with questions regarding the obligation of a player who knows she is dead to continue to play defensively, and whether or not other players are required to call her dead. (Yes, she is, and no, they are not) This line of questions led me to think about how personal ethics apply in mahjongg. Like corporate executives, politicians and sundry convicted felons, experienced players know the rules are bendable. Oftentimes situations will come up which prove to be interesting opportunities for self-discovery. While these occurrences may not rise to the level of true ethical dilemmas, they nevertheless provoke a moral challenge that each player must answer for him or herself. Susie has two Easts and a joker exposed. You know she is dead but no one has declared it. You pick an East. Rhoda has three exposures on her rack. You know you are dead. You pick Rhoda's mahjongg tile. Rhoda's your best friend and she hasn't won a game in a while. Tessie pushes out her wall out and you see she's playing a dragon hand. You pick a dragon. Each time Ray takes a tile from the wall, you can see what she picks. She's picked a tile you need. A 3 bam flipped over from the middle of the wall. You are playing 3 bams. You are on the way back from the ladies' room. Frieda has not covered her hand with her card. Sheila, who doesn't see too well, has passed you a joker. We see the Mahjongg Warrior in the video "accidentally" knock over the four dot, fully intending the cascading results that ensued. Do you think that is morally ambiguous or good mahjongg strategy? The odds are you view mahjongg as a mere frivolous pastime, unaware of the philosophical implications thereof. A simple knocked-over tile can be just that, or it can be shaded with deeper meaning - only a true mahjongg ninja will crack the code. There is a joke going around the internet: The generation born before 1946 was the Silent Generation; between 1946 and 1959, the Baby Boomers. Generation X are those born between 1960 and 1979 and Generation Y between 1980 and 2009. 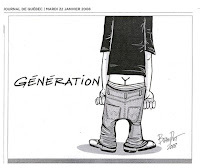 Why are they called Generation Y? Allow me to dispel this myth. I had occasion this past week to play mahjongg with some incredible gen Y kids. These young people, struggling to live and work in the fractured mess we call our economy, were able to put all that aside for a family game night with mom and her visiting friend. It was a joy to see and take part in. I wonder if my aunt, who taught me when I was nine, envisioned that I would play 50 years later with people who would not be born until she had passed away. Our family mahjongg games are some of the brightest memories of my childhood, with my aunt, uncle and cousin goofing around and learning the lessons of the game; patience, planning, dealing with the unexpected - timeless values which served me throughout my life. I urge my readers to teach their children and grandchildren mahjongg. We all know how much fun it is, how it helps your brain, but our mothers and grandmothers knew it pulls you through tough times and provides hours of entertainment for minimal cost. The League has been around for 74 years - through recessions, depressions, wars and the rest; generations Alpha through Omega. A good way to begin is to bring your set to the next family dinner. You can do it surreptitiously - leave it in the trunk of your car or bring it in and say, "Oh, I thought I brought you new silverware...." When the dishes are cleared simply announce, "We're all going to play mahjongg tonight. I've already seen that movie (show, etc.)" Come on, grandma, you can do it. Is your MBA son-in-law serving fries? Teach him mahjongg. Is your daughter spending her days in Zucotti Park calling for the execution of Alan Greenspan? Teach her mahjongg. Does your grandson barely acknowledge your existence because he's lost in his iPad? Tell him that you want him to learn so he can be the first to develop an app that lets players play over Skype. Yes! Of course you must let them win. Even though you may have eight jokers and your tile is thrown six times, do not declare mahjongg. Allow them to experience the pleasure of making a hand. They'll be hooked, you wait and see. They may even come to tournaments with you. And though it may take 30 years before they truly come to know the meaning of the game, you will have planted the seed, as I was inculcated and indoctrinated as a child, only to blossom into a maven later in life. So remember the immortal words of our Boomer friends Crosby, Stills and Nash - Teach your children well - the one they pick's the one you'll know by. A near riot broke out at a recent game. Arlene had stopped the passing and Rena was willing to option two tiles. "What? How could you do that! She stopped the passing - you'll give her mahj!" was the reaction. "Maybe I will and maybe I won't," said Rena, in words or substance. Accusations flew. A heated debate ensued. Should you option with someone who stops the passing? Maybe you should and maybe you shouldn't. Let's take a step back and think about how and why the passing gets stopped. The League states that any player may stop the passing after the first left for ANY reason. Your thumb may hurt from picking up tiles or you may have eight jokers; maybe you are set to mahj or maybe you just don't feel like giving a second left. The second left will cause her to give away a needed tile or tiles. In my book, the first reason is a poor rationale to stop the passing. Each hand is a seedling that needs nourishment and cutting off the tile supply to both is a weak decision. Better to be ruthless now in the beginning than to have to make bigger sacrifices as the game progresses. Some may think otherwise. So, to get back to the main question - do you option with someone who has stopped the passing? Maybe. Do you think the person has stopped the passing because she has a great hand or because she "doesn't know what to do"? If you listen and observe, you will know, unless she plays her tiles close to the vest and doesn't give anything away.